An afternoon at Grand Park. Credit: Brian Champlin / We Like L.A.
You know what’s handy? Waking up in the morning, firing up your phone/computer and being able to scan a super quick (but curated) rundown of the best of what lies ahead. 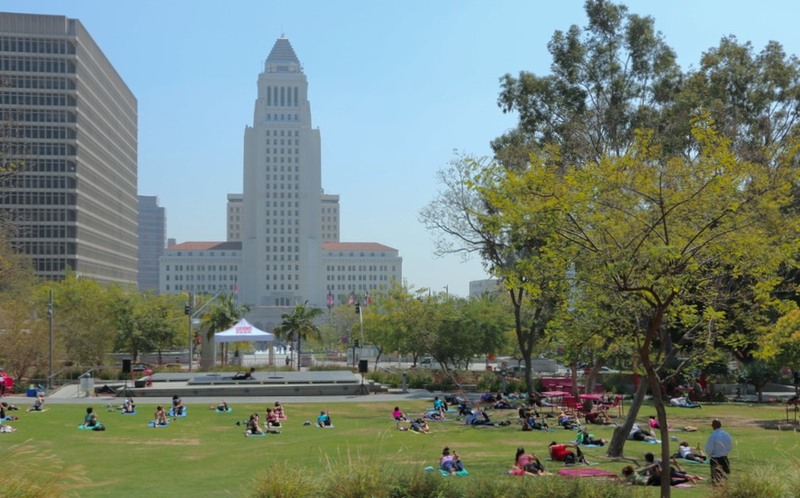 So here it is, our list of fun things to do in Los Angeles for today, Thursday, April 11, 2019. 2. [5 p.m.] The Taste of the Valley, San Fernando’s largest wine tasting and food festival returns this Thursday with over 120 wineries, 45 restaurants and more. 3. [6 p.m.] LA Art Book Fair takes over The Geffen Contemporary at MOCA April 11-14 providing artists a platform to display their books, art catalogs, zines, and more. The event is free and open to the public from April 12-14. Opening night takes place on April 11 where tickets cost $20 and comes with a limited edition work by artist Jeffrey Cheung of Unity Press and a special musical performance. 4. [6 p.m.] The Downtown Art Walk brings art enthusiasts, art galleries and locals together every second Thursday of each month for a night of exploration. 5. [6 p.m.] Universal Studios Hollywood hosts a Dark Arts at Hogwarts Castle Premiere Night April 11 – 12. Festivities begin with a walk down the red-carpet with plenty of photo-ops, followed by a catered diner. The main spectacle lies in the Hogwarts™ Castle, which will be covered with sinister curses and frightening creatures featuring the Dark Arts, a brand-new, striking presentation of light and music. 7. [various] I want to live in your mouth is a a new, immersive horror experience at Zombie Joe’s Underground theater in North Hollywood, specifically designed for an audience of one (if you’re daring enough!). Performances run Thursday to Sunday through May 5. 9. [various] Eataly presents Thursdays with Chef Michael Cimarusti where guests can enjoy a special seafood dinner prepared be their eyes by two-Michelin-star chef Michael Cimarusti at Il Pesce Cucina.